A modern take on the Japanese stroll garden is forming around the plaza level of the Trammell Crow Center in the art district of Dallas. 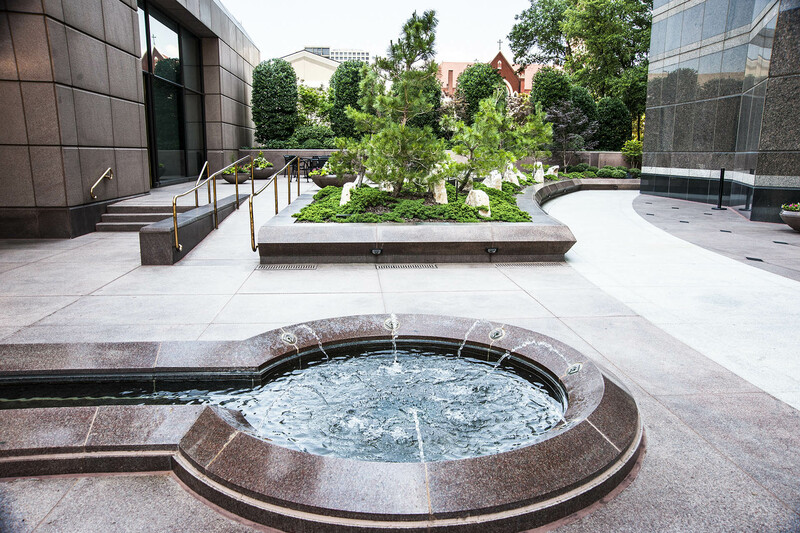 Designed to expand the footprint of the Crow Collection of Asian Art, a free museum across the street from the Nasher Sculpture Center, this garden shows a different aspect around each side of the building. One side of the building features a stone arrangement, another a dry riverbed, another a shady grove or bamboo thicket, yet another karesansui 枯山水 or flat landscape traditionally with raked gravel. The Dallas Arts District web site notes, “The Trammell Crow Center was deigned by Skidmore Owings & Merrill partner Richard Keating in 1984. Corporate offices are located on the upper levels of the building, and retail on the ground floor and mezzanine level. Planning for the new garden began by 2009, the year John Powell made a presentation on the design to the Women’s Council of the Dallas Arboretum and Botanical Garden spring meeting. Extensive installation work began in 2011. The new sculpture garden is slated to open later this year. When we visited in June, the sculpture had yet to be placed. We parked beneath the office building — nearly empty on a Saturday morning — and took an elevator to the lobby level where security directed us to the garden and gallery beyond. It was a Frisbee competition that first took garden designer John Powell to Japan in 1993 and he fell in love with the gardens. He launched an intensive study of Japanese garden design, construction and maintenance and in 1997, he attended the first Japanese garden seminar provided by the Japanese Garden Research Center at the Kyoto University of Art Design. This was followed by internships with Suzuki Zoen in Niigata, and at the Adachi Museum of Art in Shimane Prefecture. He was the first westerner to train as a gardener at Adachi. Powell has become a respected part of the Adachi garden family and in 2006 spoke in Austin at the Taniguchi Garden Revitalization committee on Gardens of the Adachi Museum. This was part of a speaking tour with Wataru Takeda, Section Chief of the Business and Public Relations Department at the Adachi Museum of Art and, for the California presentations, Kiyoharu Mori, Deputy Director of the Adachi Museum of Art. The presentation also was given at The Modern Art Museum of Fort Worth, The Crow Collection of Asian Art, Houston Museum of Fine Arts, The Japanese Friendship Garden of San Diego at Balboa Park, The Asian Art Museum in San Francisco and Merritt College in Oakland. Powell is in demand as a workshop presenter and speaker for organizations such as the 6th International Symposium of Japanese Gardens in San Diego, the International Conference on Japanese Gardens Outside Japan in Long Beach and the Maple Society North America Branch. The Trammell & Margaret Crow Collection of Asian Art is located in the Arts District of downtown Dallas. The Crow Collection is a permanent set of galleries dedicated to the arts and cultures of China, Japan, India, and Southeast Asia. The museum offers a serene setting for both quiet reflection and learning. The Crow Collection’s European sculpture pieces formerly displayed in this area were re-located to the Old Parkland campus.